just an update. when i got my new job i made the singular request of taking this day off. no problems, just have to let them know a while in advance. so i'm in unless an act of god. come spring it looks like i'll be working 3 jobs, 7 days a week. but not that monday. This will be my first rally and am looking forward. I'm sure though that the ability to check your firearm with Capitol police is not unlimited but does anyone know how many they can accommodate? Just wondering what my chances are of not making it inside. Thank you for standing up and helping to protect the 2A. As I understand it, they must accept your firearm regardless of how many others have been checked in. It's really not an issue, the last rally had over 800 people and there were less than 50 guns in the gun room. The capital police have always been professional and I don't wish them any problems, but if we get so many people at a rally checking Firearms that it causes them to not know what to do with them all, I will have a smile ear to ear that day. You can join me out front with a rifle. 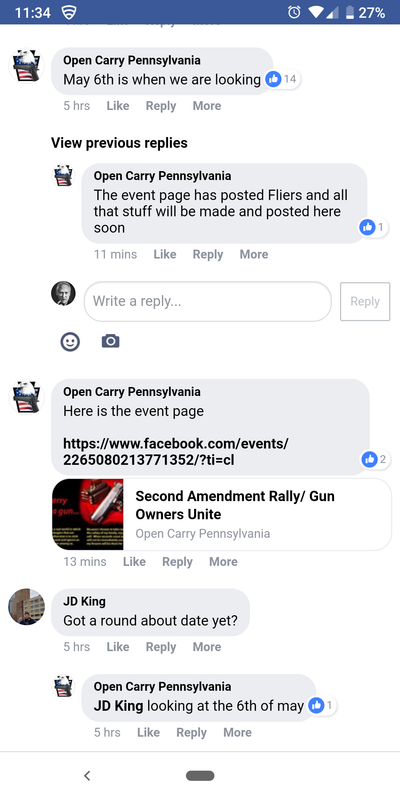 Open carry pa put up event page. Are the actual organizers going to put one up? Maybe open carry PA is the media arm now? They doing the flyers? No different than you or someone else posting up a thread to promote it, I suppose. Unless/until they make it look like it's "their show" - then they cross a line. 2A rally in Harrisburg 4/29. Who's going? Anyone going to the rally in Harrisburg?